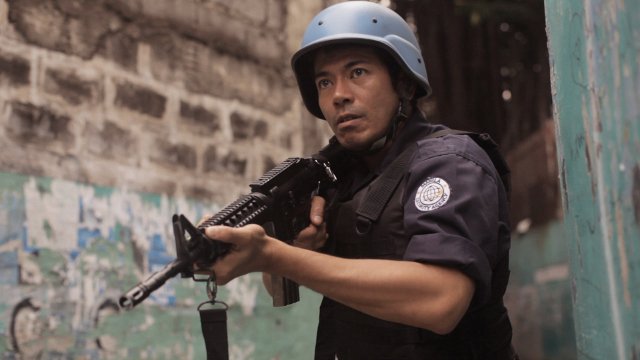 The inspiration for Sean Ellis’ newest film came whilst he was on holiday in Manila. As the writer/director watched two armoured truck drivers having an argument, he began to think about the circumstances that led them to that point. That germ of an idea became Metro Manila, just announced as Britain’s submission in the Best Foreign Language Film category for the Oscars. Starting as a moving portrait of an impoverished rice farmer and his wife, the film shifts gears mid-way through to become a tense crime drama. We spoke to Sean about the film. Metro Manila is entirely in Tagalog. You don’t speak the language, so how did you create the film? Well, the script was in English. There was talk of doing a translation but I felt that if someone translated the script then it was another interpretation of what I’d done. It’d be like having another author. Then in the casting sessions it became apparent that it was easy for the actors to speak about their lines in English and translate them into Tagalog in a way that they felt the characters would say. It slowed us down a little bit because they had to learn the lines in English and then translate them, and then there was discussion between the two main actors about the intonation of what was being said and how. How did that process affect how you directed the actors? I think when you write a script you’ve got an idea of where everyone is emotionally. You’re there for the actors in that respect if they’re wondering how should they play a scene, whether the character is upset or angry. So once the translation had been done it was just dealing with acting. The great thing about acting is that most of it is non-verbal, so I could sit there and watch them speak Tagalog and know whether it was a performance I believed in or not. The performances are very naturalistic. I really tried for that. I don’t think they were used to the sorts of silences that I was asking for, because in the Filipino school of acting they make a massive amount of stuff for TV. I kept saying things like, “That’s great but slow it way down. Make it more difficult for you to say, as if you’re searching for those words”. They would then do that for what they felt was a long time and then we’d look at it and maybe even say let’s do it more and see how far we could take it. It just felt right for the material. What this family has to go through is an emotional and difficult journey. I felt like some of those silences would say more than what their words could. The crime elements in the film aren’t introduced until quite late on, about an hour in. Was that a conscious decision? In some respects it’s a cross-genre film. It starts off as a world cinema drama and moves slowly into a heist movie, and I thought that was an interesting combination because I love world cinema but at the same time I do like more commercial fare as well. I always said that it was a very commercial story in disguise. I feel like one thing compliments the other–it serves to reinforce the characters and the empathy you have for them so by the time the crime stuff kick in you’re going through that gauntlet with them. Before film-making you had a long career as a photographer. Is that why you chose to be your own cinematographer on the film? Obviously I’ve got a photographic background so I’d like to think that visually I know what I’m talking about to a certain extent, but in many respects it was a budget call as much as a creative one. Being my own cinematographer had a massive impact: it enabled us to not have to buy five flights to Manila and put five people up in hotels for three months. When you’re talking about the budget that we made the picture for, that sort of thing makes a huge difference. I suppose that by shooting it yourself it gives the film a lot of fluidity. There’s an emphasis on handheld shots. It looks almost like a documentary. I felt that style of film-making would help the audience to relate to the family, because you’re right there with them. Also, I wanted the story to be first and foremost. I think that the more that visuals lead storytelling, the more the audience falls off. So if there are any visual flourishes in the film it’s to back the story, to reinforce it. There are probably two big visual moments in the film, but they’re earned.